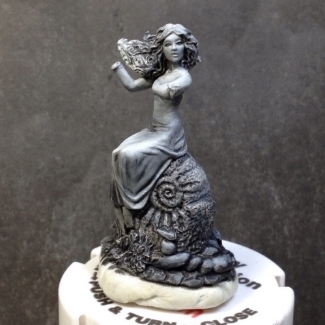 After a frustrating first attempt painting Euterpe, I'm approaching this miniature in a different way. This time, I decided to envision this Greek muse with a rich olive skin tone. I really liked Reaper's "Olive Skin Shadow" and I decided to buy the rest of the triad with Euterpe in mind. Once the shipment arrived, I experimented a bit with this skin color triad on a "Shelf of Shame" miniature Elori who, at some point, had two hands (the missing hand once held an epic scythe). I made the mistake of bringing an unpainted Elori to a D&D game years ago where she stood-in as an evil sorceress boss. Afterward, she fell into the black hole bag of NPC/monster characters and was forgotten about for some time. When I finally found her, she had a stump and her scythe was nowhere to be found. I'll still use her for experimental paint colors & techniques-- I'm convinced I should paint her with a bloody stump for an arm to practice painting blood effects.. but I digress. Now that I had found the right blending mixes with this new Olive Skin triad, I knew I was ready to paint Euterpe! I used Olive Skin as my base and used a 50/50 mix of base color + Olive Skin Shadow for my first shadow color. I progressively deepened the shadows in thin layers before I applied a similar 50/50 base coat + Olive Skin Highlight for her cheekbones, forehead, the bridge of her nose and chin. I used the same first highlight in thin layers on the tops of her arms and feet. I need to paint her eyes before I apply the second brighter final highlight. I'm influenced by the painted studio version in my color choices. I attempt to choose drastically different colors from the studio model. When #1 occurs, I end up picking similar colors that I can't help but envision the miniature in. Often times, I struggle with colors I've forced myself to use in the desperate hope that it will end up looking like the studio model (nice try). I also think "If the studio painter thought these were the best colors, why would I try something drastically different?" When #2 occurs, I challenge myself to envision the miniature in a completely different way and I choose colors that do not exist in the studio model. I find this limits my creativity as I force myself to avoid colors that I probably would have chosen from the beginning. Both #1 and #2 happened during my first attempt at Euterpe. When I saw the beautiful skin tone of the studio model, I thought, "Euterpe the flautist muse should have a delicate, fair skin tone". Another part of me thought, "But the studio model has a purple dress. Now I can't paint a purple dress". Both of these thoughts led me to spend far too much time trying to create something that felt forced to the creative part of my brain. When that happens, I'm rarely able to complete a project that I'm happy with. I don't always have to be happy with the final outcome, especially if I'm just experimenting with a new technique. However, I love the Euterpe sculpt too much to make any compromises! So I went ahead and chose purple for her dress, though it's more of an amethyst jewel purple than the muted purple in the studio model. Not that there's anything wrong with the painted studio version-- I just like my version to be a little bit different and I love rich, saturated colors! 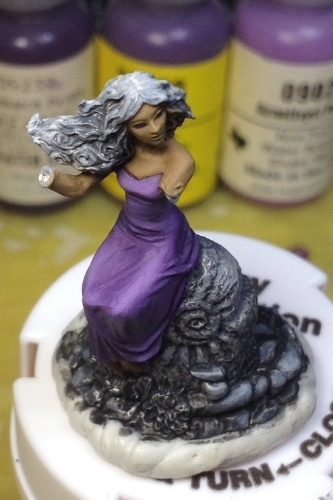 I'm still in the blending stages of the purples-- I want her dress to really stand out with more contrast. In the end, it will have brighter highlights and darker shadows in the deeper folds. In the meantime, I need to decide on her hair color. Do I want something natural like a mahogany brown with golden highlights? Or do I want to paint her hair in a fantasy color, like an interesting turquoise?